"He (Sammy Wanjiru) can set a world record in the marathon, but I would like to emphasise winning over achieving a fast time. I like to coach a winner." Available on demand a few hours later as well. LetsRun.com 2008 Flora London Marathon Women's Press Conference: The $250,000 and $500,000 Ethiopians Adere and Wami Set to Battle Huge paydays don't seem to have killed the desire of the two Ethiopian stars. They'll have a slew of challengers including Kenyan Salina Kosgei who was unable to leave her house for three weeks due to the violence. *Gete Wami Actually Is Disappointed Radcliffe Isn't Running While Wami correctly points out that Radcliffe brings out the best in her, we think she's crazy to want to face Radcliffe in the marathon. Wami's judgement is probably clouded by the 1999 world champs 10k. "I remember Paula led for 23� laps and I won. That's my best memory." *39 Yr Old Widow Lyudmila Petrova Runs For Her Children Two years ago the Russian set a national record to get second at London - a year after her husband was killed in a car crash. *Profile Of 21-Year Old Phenom Sammy Wanjiru Wanjiru is not your typical Kenyan as he hails from the Central Province (not the Rift Valley), he grimaces when he runs and he is based in Japan. He's also way, way better than your average Kenyan. He's also got a great coach in 1992 Olympic marthon silver medallist, Koichi Morishita. *100 Years Ago: The First Marathon In London The 1908 Olympic Marathon had a crazy finish as the winner was DQd after collapsing 5 times on the track. The drama resulted in the marathon distance being set at the 'London distance' of 26.2m. *World Champ Luke Kibet Recalls Seeing "Terrible Things" & Narrowily Escaping Death In Kenya He missed two weeks of training but it could have been a lot worse as the same mob that beat him, killed Lucas Seng. *London Times Profile Of Ryan Hall We missed this one yesterday. 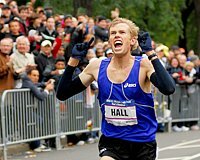 LetsRun.com Ryan Hall:"The Future"(And Present?) Western Civilization's great hope received the compliment of a lifetime at Wednesday's press conference when reigning Olympic champ Stefano Baldini called him "the future" and said he could win "a lot of medals." Hall himself seemed full of optimism and certainly didn't try to downplay expectations for Sunday. "Last year I proved I can do it through 23 miles (37 kilometers). This year, my expectations have grown from that." *Video Highlight of Press Conference at link above. LetsRun.com Flora London Marathon Men's Press Conference The greatest marathon of the year is Sunday and we're there to bring you the action. Only in London is the field so loaded that the 2nd fastest marathoner from the year before (Emmanual Mutai) is not invited to the press conference. How can that be? Because London has Ryan Hall, Martin Lel, Luke Kibet, Stefano Baldini, Sammy Wanjiru, Abderrahim Goumri, Felix Limo, Hendrick Ramaala and others. The piece includes video from Lel and Wanjiru. The 36-year-old doesn't think he can win in London but he's hoping to defend in Beijing. *Paula Radcliffe Offers Training Tips and Gives Insight On Her Rebound From Injury Radcliffe missed 8 weeks due to her toe injury but has been back running for two weeks now and is feeling good. *Nice IAAF Profile of America's Great Hope Ryan Hall The author points out that in less than a year, Hall has gone from a marathon virgin to being annointed as "the future" by the defending Olympic champ. Remarkable. Hall: "I certainly believe I can win." March 31 - April 6, 2008 We give praise to potential 2008 Olympic marathoner Lisa Koll, fast youngsters & geezers, and ultra-marathon legend Bruce Fordyce, sympathy to Sam Bair III, and scorn to Dwain Chambers and Justin Gatlin for making the entire sport look bad. We also take a trip down memory lane and recall the 2002 Penn Relays 4 x mile when the much-hyped Stanford squad totally flopped (you're welcome, Grote). Colleen De Reuck Out of Olympic Marathon Trials The almost-44-year-old defending champ is out with an unspecified injury. She did run a 57:17 at the Cherry Blossom 10 miler on Sunday (which is only 2:30 pace), so maybe that made her reconsider. New World Record For Fastest Marathon By A Married Couple Is Set In Paris Kenyans Simon Munyutu and Martha Komu ran a combined 4:34:57, with times of 2:09:24 for him and 2:25:33 for her. One We Missed: Dennis Simonaitis Sets Age US 45-49 5k Record at Carlsbad 14:47 is very impressive at that age. Dwain Chambers Enjoying Rugby League Tryout He may actually play a JV game this weekend. We'll really start our blowout coverage on Wednesday with Ryan Hall's press conference. (Ryan is going to get a lot of attention this week as he has two press conferences). But the London betting odds are already out. More Info on US 10k Champs: Richmond Times Dispatch Newspaper Article on Abdi's Win at US 10k Champs More here. *Weldon Wins $2500 in AT&T Dash for Cash Unfortunately it's wasn't Wejo as he'd have trouble beating Abdi with a 3 mile head start. Lisa Koll Runs American Collegiate 10k Record at Stanford 32:11.13 for the unheralded Koll and she's only a (redshirt) sophomore. She beat Blake Russell (32:14) and Magdlena Lewy Boulet (32:33), who both were prepping for the Olympic Marathon Trials in 2 weeks. Koll's claim to fame in high school was an 8th place finish at the Iowa state meet in XC, but she is showing how much upside this likely future American star has. She was 2nd at NCAA indoors in the 5k. March 24 - 30, 2008 Since April Fool's day was yesterday, we decided to recap the previous week in distance running a day later than normal. We give praise to Australian women, Keninsa Bekele, the Dibaba sisters, James McIlory, Jorge Torres and others. We're sure our thumbs down will rankle some as we yet again refuse to be PC and give thumbs down to Europe and Moroccan-born EPO cheats. We even give you a list out all of the convicted EPO cheats since 2003. Good Riddance: Drug Cheat Dwain Chambers To Play 1st Pro Rugby Match Just 9 Days After 1st Touching Rugby Ball The coach doesn't want to waste any-time as Chambers is doing a one-onth unpaid trial. Justin Gatlin Makes Our Sport Look Bad: Forget about getting busted for drugs, Gatlin did even wrose. He only ran a 4.42 40 at the NFL combine (slower than a ton of NFL prospects). *Leonard Patrick Komon Barely Made Kenyan Team for Worlds, But Leaves Worlds With Silver Medal At the Kenyan Trials, he got a stitch, faded back to the 40s, and then battled back to finish 7th. On the boards: What would the US have finished in World CC team results w/ best lineup racing? Arizona State Wins Men's & Women's Team Titles as Kyle Alcorn Shocks Field & Wins 3k To Lead Sun Devils To Team Title Over FSU On Friday, Alcorn led ASU to a surprise 2nd in the DMR. On Saturday, he shocked everyone once again and blew away the 3k field with a big kick in the next to last event to put his team into a tie with FSU. It came down to the 4 x 400 and ASU edged FSU by a second to win. Alcorn's never been a real big collegiate name before today, but he apparently had a gnarly 55 second last lap in HS in the 3200. In other action, Texas' Leonel Manzano completed the DMR/Mile sweep as was expected by winning the mile with the big surprise being that his teammate Jake Morse was 2nd. The other big surprise was how average the field looked considering you had to run 4:00 to get in. In the ladies' distance races, it was all FSU as Hannah England won the mile and Susan Kuikjen won the 3k. Saturday: Is there anything left for the Kenyans? Deresse Mekonnen Dan Komen Deresse Mekonnen Wins 1500 Mekonnen originally won the race but was DQd along with Nick Willis (for stepping on the infield.). In other action Meseret Defar blew away the field in the women's 3000m with a 28.8 last lap. Nick Symmonds looked incredible in his 800m semifinal. Liu Xiang got his first indoor gold and all that is left is gold in Beijing. American veteran Allen Johnson got the silver. *Friday Recap: Christian Cantwell Wins Shot, Angela Williams and Olusoji Fasuba Win 60 Olusoji Fasuba got Africa's first gold in the indoor 60 as Britain's Dwain Chambers ran a pb to get silver in what may be his final race as everyone is trying to blackball the ex drug cheat from the sport. Ryan Hall Update: 34:25 Video Interview. We'll have more on Ryan, and our 2008 Flora London Marathon Predictions by Saturday but are putting this up now. Free beer, tshirts, and more. If you want to come click above. Marion Jones' 8 Relay Teammates Told To Return Medals The IAAF told Jerome Young's teammates to do the same thing but lawyers stopped the IAAF from making them do it. Head of WADA Warns Olympic Hopefuls About New HGH Test He says the belief that HGH can be cycled through the body quickly and not get detected by a drug test is a thing of the past. The new test will supposedly last longer. Profile Of Steeplechase World Champion Yekaterina Volkova Training at a high level isn't easy for Volkova, who is forced to leave her 3-year-old son for long periods of time. She, in turn, uses him for inspiration. May 3rd Jamaica Meet Will Feature Ridiculous Sprint Action in Veronica Campbell-Brown, and Americans Tyson Gay and Kerron Clement. How Will Jews Do At The Boston Marathon? Passover starts two days before. IOC Likely To Strip Marion Jones Teammates of Their Relay Medals From 2000 They aren't sure if they will re-allocate the medals or not. We're not sure why they re-allocated her individual gold to a fellow drug cheat. Again, once you are banned for drugs, all of your performances should be erased. Period. Alan Webb's DNF Ended Up Being A Bit Embarrassing As 10,000 Spectators Wanted To See Him Win This commentary by Loren Nelson is pretty good and includes quotes from Raczko and Webb who both appear to be guessing for answers. Webb: "For the most part, I felt pretty good for this race. I'm doing a little more (training) than I can handle right now, I guess." Raczko: "He, like everybody else, is going to have setbacks from time to time. When you're trying to train at such a high level, sometimes you bonk a little bit, I guess." Fore!!! Paula Radcliffe Won't Be Hit By Golfers In Olympic Buildup in Macau The world record holder is certainly meticulous in her preparations. Any fears she'd be nailed by a golfer have gone by the wayside as the British have secured a longer period of time for training on the golf course. European Cup 10,000 Is This Weekend Lornah Kiplagat To Run 1st Track Race In Nearly a Year She'll be after the Olympic A standard but will have her hands full with former 5k world record holder Elvan Abeylegesse as well as her own cousin Hilda Kibet, who just finished 5th at world cross country. Olympic Torch Has to Be Extinguished 5 Times Due to Protests in Paris Up next: The torch comes to the US. Hillary Clinton has called for a boycott of the opening ceremonies, but we have a better idea. 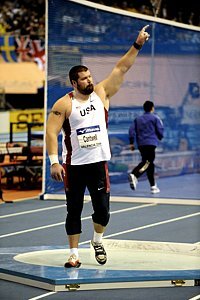 The athletes, instead of waving, should do the sign language symbol for SPEECH, which a letsrun.com fan tells us is a wave with the back of the hand facing out. *Polo to Outfit US Team at 2008 Olympics in Opening Ceremonies If the ceremonies are boycotted, no one will be able to see all the clothes made in China. Tariku Bekele and Mestawat Tufa Win XC Race in Sardinia Tariku needs to start running world cross. 2nd Straight Disaster: Time To Panic? Alan Webb DNF's at Carlsbad 5k As Ethiopia's Terefe Zewdie Edges Mo Farah A 16th place finish in the US 8k a few weeks ago was attributed to food poisoning, but Alan Webb is now at a total loss to explain his shocking DNF from Sunday. Making things even worse for Webb is the fact that the opening pace was slow (4:25 opening mile) and Webb was struggling to keep up. *Alan Webb crashes and burns....in early season road races..
More: *San Diego Tribune Article on Webb: "Pretty much after 800 meters, I was hurting"
*AP Article on 2008 Carlsbad with more quotes from Webb Webb: "I was going to just jog it in, but I couldn't even jog." Cherry Blossom 10 Miler In DC: Ridouane Harroufi and Lineth Chepkurui Win Harroufi took the first 5 miles out in 23:05 and then outkicked Nicholas Kamaky by 1 second to win in 46:14. Chekurui, who was 14th at world xc last week, won in 54:21 as Catherine Ndereba was 4th in 54:52 . *Prerace Profile: Ndereba Focused on Winning Gold in Beijing Interesting to see that her agent says she hasn't been invited to Boston for 3 years. Great Ireland 10k: Doris Changeywo Pulls Away From Jo Pavey - B. Johnson was 7th- Abraham Chebi Wins Men's Race in 28:48 Pavey left the race pleased with her fitness as Changeywo, who was 4th at world xc last week, only pulled away from her on the last hill and Pavey isn't a good hill runner. The good news for Pavey: there will be no hills in the Beijing 10k in August. Suicide Bomber Kills 12 at Sri Lanka Marathon Olympic Marathoner K.A. Karunaratne was one of those murdered. Sri Lankan Minister: "This should serve as a wake-up call to the international community to redouble its efforts to combat terrorism in all its forms and manifestations"
World XC Women: Tirunesh Dibaba Back on Top link fixed Ethiopia swept all the individual titles as Tirunesh Dibaba used her strong finishing kick to regain her individual crown after she battled back from being dropped by the leaders. Former Minnesota star Emily Brown led the US women to a fourth place finish. Torres is probably the only guy in American who can say this: every time he has raced Alan Webb, he has beaten Webb. Torres, now training under the legendary Steve Jones, got the win in the final 800m over the very impressive of late Andrew Carlson. Alan Webb had some food poisoning on Thursday and despite leading at 5k faded to finish 16th. Shalane Flanagan had some stomach problems of her own on Thursday but they only seemed to limit her margin of victory as she won over Katie McGregor. On the boards: *Why did Kastor pull out of Lisbon? *How good was Shalane Flanagan in high school? And only on LetsRun: Is NY Gov David Paterson a Marathon Cheater? The guy is blind and likely ran without a chip or before they were turned on but nonetheless clearly the sleuths on the message boards do not discriminate on physical disability. In other news, Eliot Spitzer went for a long run in the Park once he knew the news of his prostitution ring was going to break. LetsRun.com Alan Webb, Carrie Tollefson, Shalane Flanagan on the Road to Beijing America's finest addressed the media and letsrun.com was on hand to cover it. From, Shalane Flanagan's praise of Mary W. "What Phil Knight (chairman of the board of Nike) is to Nike, Mary (Wittenberg) is to distance running. ", to our 50 minute audio/video interview with Alan Webb on page 2, we've got it all. Text, photos, and video and even and mp3 you can download. Page 2: More Relaxed, Confident Zen-Like Webb Ready for 2008 We sat and talked to Webb for 50 minutes and have a recap plus video and audio. Webb talks about his 2007 season, his goals for 2008, his desire to win races and how in high school he "did not know what he was doing". Above photos courtesy of Steve Starr. LetsRun.com! 2008 Millrose Games Recap: Lagat Gets #6, Nelson Entertains, and Goucher Gets It Done Track and field's biggest indoor event saw Bernard Lagat capture his 6th Wanamaker mile, Kara Goucher get an exciting woen's mile win, and our hero Adam Nelson throws some bombs and entertains the crowd. Plus, upsets in the women's pole vault, women's hurdles and more. *LetsRun.com! Recap of 2008 Millrose Games High School Miles The boys mile is always the loudest event at Millrose. Saucony To Pay Tribute To Ryan Shay On April 17th They are releasing a new Shay xc shoe for next year.